Wondershare Scrapbook Studio allows to create eye-catching photo scrapbook, miscellaneous web graphics, share with friends via email directly and print the scrapbook layout quickly with high-quality. Plus, It's well suited for stunning slideshow effect. With background images, audio tracks, easy-to-use design space and fabulous scrapbook content, you'll be making spectacular creation in no time! It's unique compared with other general graphics editors. Then, share your precious memories with friends and family Now! Specially designed for scrapbook green hands. Intuitive interface and clear workflow enable you to create professional looking scrapbook without any scrapbooking knowledge. You need nothing but scrapbook ideas! The robust photo editing tool helps you crop, rotate and flip photos, add frame, shadow, mask, text as well as special filter effects to photos. Scrapbook Studio provides a large number of pre-made page templates and a huge selection of art words, frames and clip arts to decorate your scrapbook page. It can't be any easier to share your photo scrapbook, because you have Scrapbook Studio! Output image, generate slideshow, make screen saver, set as wall paper and send out via Email -- five sharing ways spread you fun freely. Create gorgeous scrapbook slideshows with music and eye-catching transitions and output them as executives -- exclusively convenient to share and absolutely compatible with any operating system. Wondershare Scrapbook Studio offers unique, original artwork suitable for digital scrapbooking and photo collage as well as being printable in paper and sharing scrapbooks with family and friends directly via E-mail or slideshow. Inspire you to create more commemorative memory in minutes. 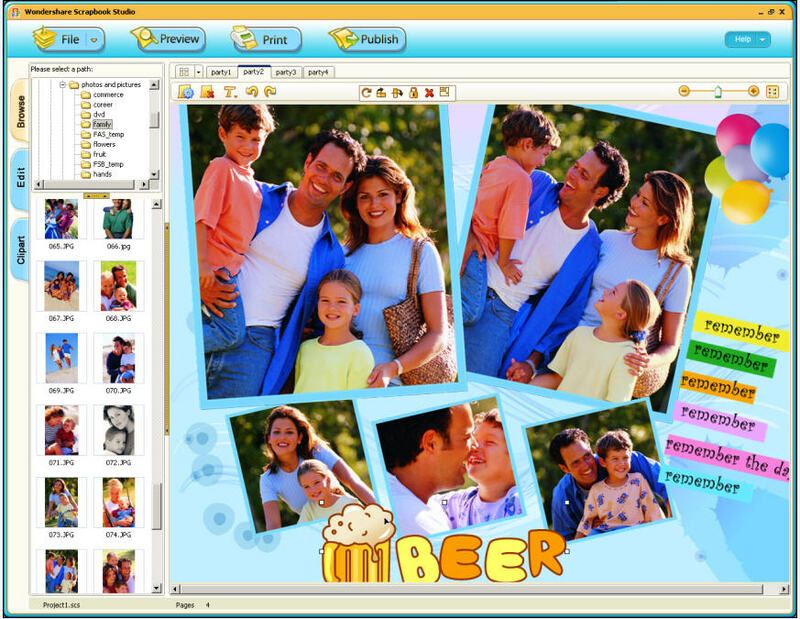 VSO PhotoDVD - VSO PhotoDVD is the best DVD Photo Slideshow Software to create DVD's from your photos. Watch your pictures on any home DVD player. Web Pictures Searcher - It is the tool for you to search the pictures on Google. It can access your favorite web sites with a maximum of 8 threads simultaneously.